Are you missing teeth and looking for a reliable tooth replacement option to restore the appearance and function of your smile? If you are having trouble eating or speaking properly, it might be time to consider improving your dental function with removable partial or complete dentures. Dentures are one of the oldest and most reliable methods to replace missing teeth and give you the freedom to eat the foods you love. By replacing your missing teeth, you can support your nutrition and have a better chance of staying healthy and having a good quality of life. Partial dentures are for patients who still have some of their natural teeth. At our Edmonton dental office, we design partial dentures to match your natural teeth so no one will notice you have a partial denture. Partial dentures are usually made of a combination of metal and resin and we design them so that, when worn, they look like your own teeth. By replacing your missing teeth, we not only improve your appearance but also the function of your teeth. 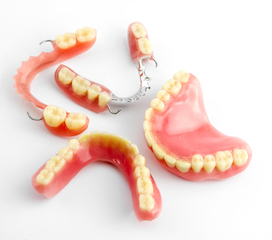 Complete dentures are for patients who are missing all of their teeth on their upper or lower arch. Complete dentures usually consist of a pink (gum-coloured) resin base and natural looking teeth. We can design your complete dentures to be a shade and shape that works well with your bite and looks natural. The days of blocky, one-size-fits-all, false teeth are over. Complete dentures are more attractive and comfortable than ever before. Are your current dentures fitting poorly or falling out when you talk and eat? Your bone structure changes over time, and dentures loosen their grip. When you lose teeth, your jawbone can begin to reabsorb. Teeth act like anchors to help maintain your bone levels, and without them, your jawbone can deteriorate. When you have dentures, they may fit well for years, but a day may come when you notice that they do not feel as tight or as secure. This is because of your changing bone structure. We can reline them to a degree and help with the fit, but eventually a replacement becomes necessary. Our dentists can look at your current dentures and determine the best course of action to restore their fit and function. Cleaning your dentures and taking care of your gums is incredibly important to keeping your mouth healthy and comfortable. Using only cleaners made for dentures is recommended because some chemicals can damage your dentures. When you clean your dentures, examine them for any damage and let us know if you need a repair. You may think because you have complete dentures that a dental exam is no longer necessary, but it is. At your regular dental exam, we will not only look at your dentures for any broken teeth or minor necessary repairs, but we will also perform an oral cancer screening. Your dentist is your best defense against oral cancer because they look for the signs of early cancerous cells. We also check the health of your gums and look for any suspicious cysts or sore spots that require treatment. Do you need new dentures or do you have old ill-fitting dentures? Call Kingsway Dental Centre in Edmonton, where Dr. Jim Haymour, Dr. Everett Postill, and Dr. George Laschuk, along with our entire professional dental team, look forward to assisting you.